At the northern end of the old Midland branch line sat Great Malvern station, a stop which was shared with the Great Western's Worcester-Hereford line. 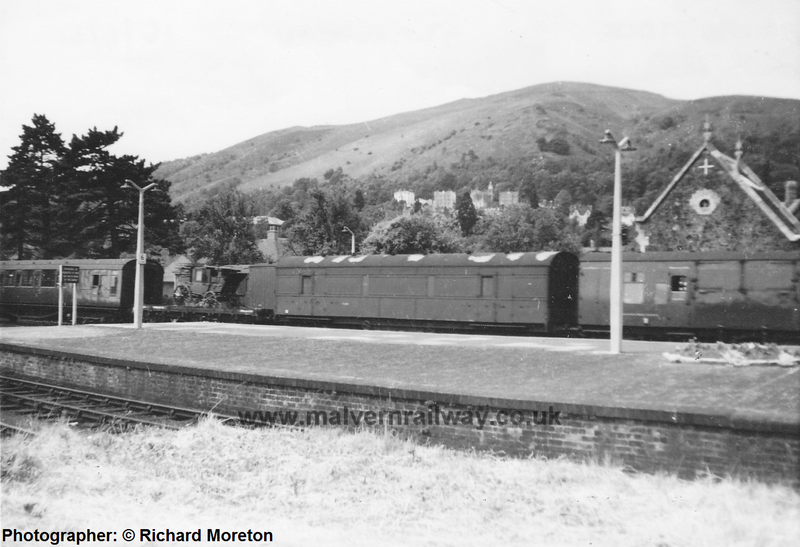 Although the mile or so between the station and Tewkesbury Junction was operated jointly, the Midland Railway built its own bay platform at Great Malvern to allow its services to terminate before heading back to Ashchurch. 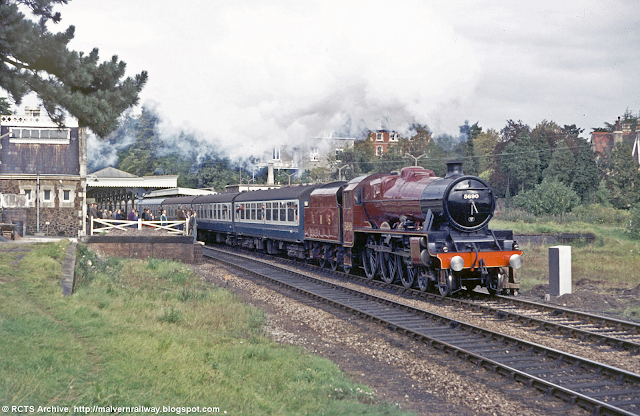 Today, the station is still used by over half a million passengers a year who join the regular services to Birmingham New Street, Birmingham Snow Hill, London Paddington, Bristol Temple Meads and Brighton. Indeed, it is still possible to get to Ashchurch directly from Malvern today, albeit via Worcester instead of Tewkesbury. 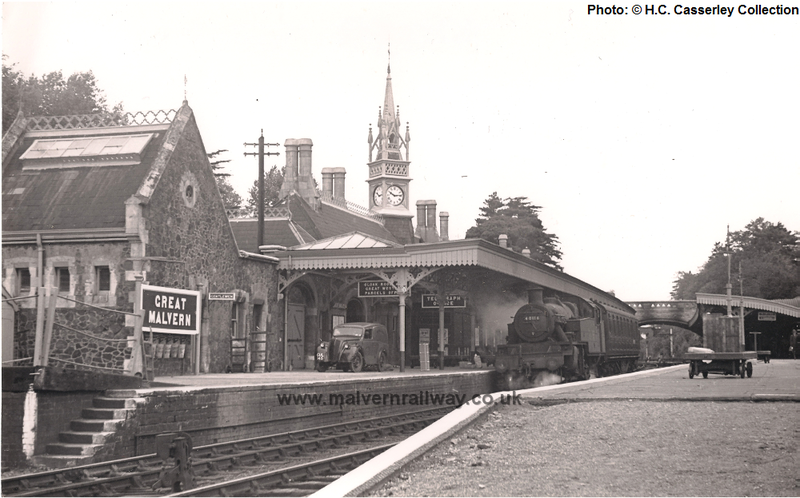 Great Malvern station opened in 1860. The original temporary station was built by railway engineer J.G. Ballard for the Worcester and Hereford Railway (later GWR), and lasted only two years before it was replaced by the current Grade-II listed structure. 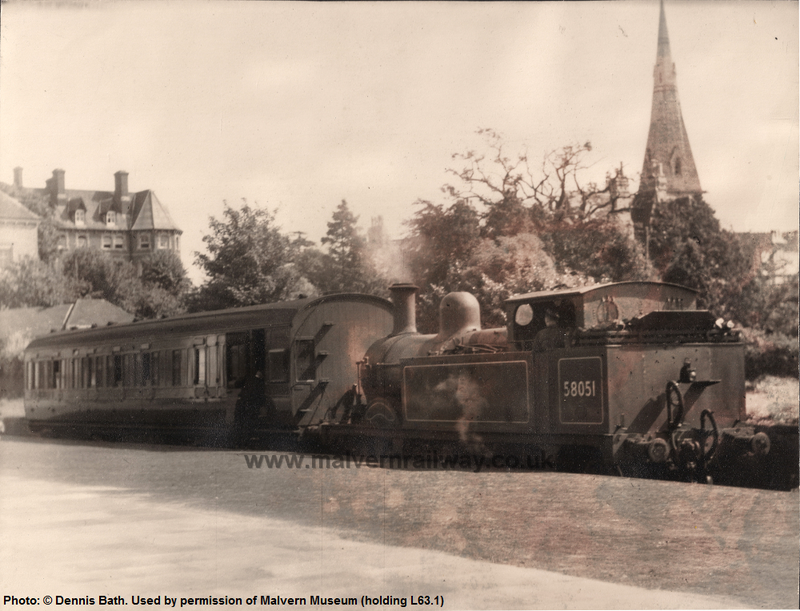 There are very few pictures of the original station, but these two have been taken from the excellent collection of Ballard's original photographs hosted by Herefordshire History. The first shows the original hut, with a rare view of North Hill, unobstructed by any houses or trees. Below, we can see two shots of the 1862 Edmund Elmslie-designed station that replaced Ballard's wooden shed. Not much has changed in 45 years from this angle! 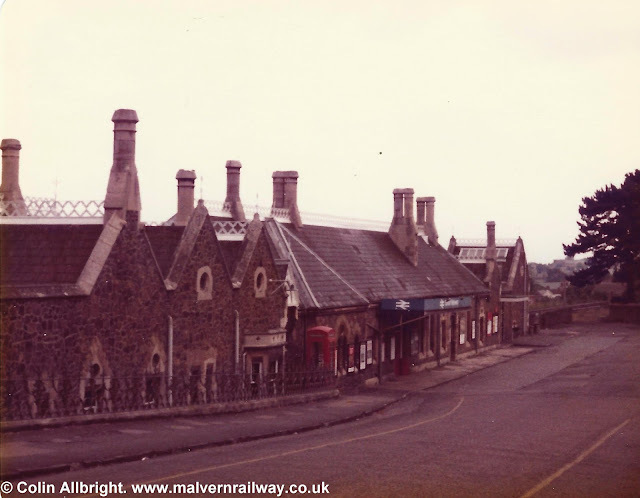 Great Malvern Station in 1967. The same perspective in 2016. 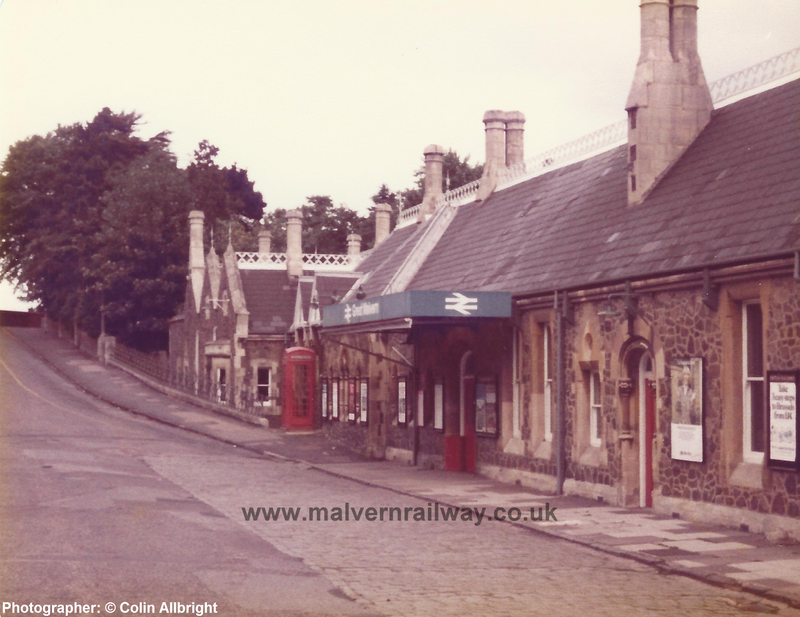 The front of the station in the 1970s with the old British Rail awning. Looking across the station car park, also late 1970s. 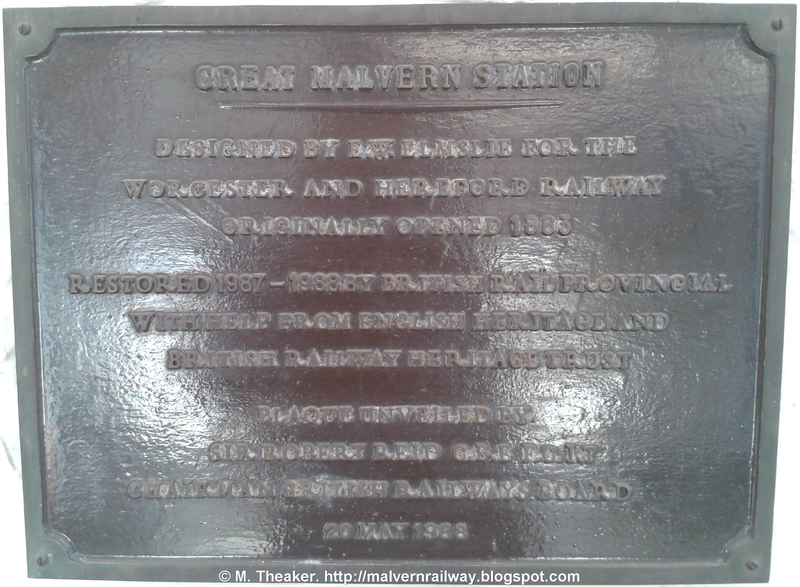 This plaque from the foyer explains the station's history. 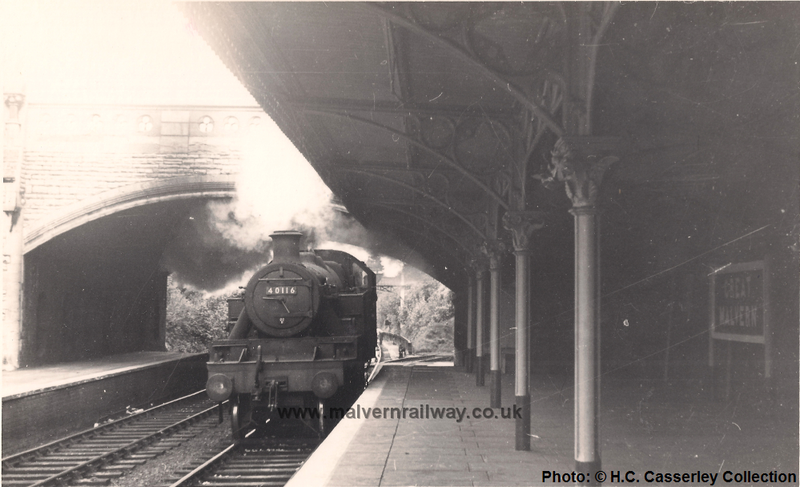 The first missing feature from Great Malvern station is the 'down' bay platform used by the Midland Railway for its Aschurch services. The bay ran along the eastern side of Platform Two and behind what is now the station bookshop to stop directly in front of the passenger tunnel linking the station with Thorngrove Road. 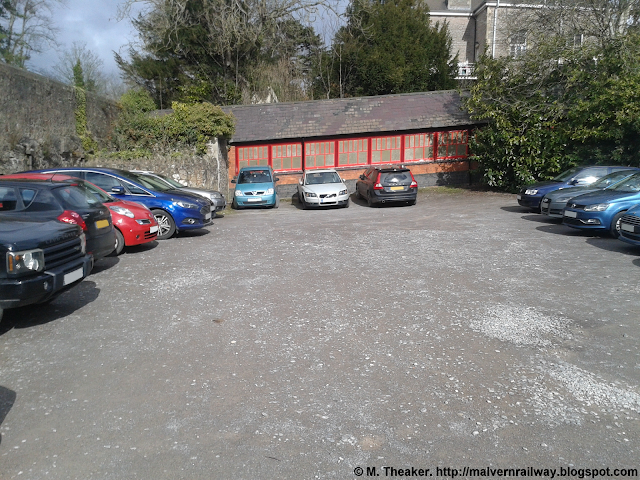 After the spur was removed, the easternmost strip of the land was eventually used to build bungalows in the 1980s, while the infilled bay itself now forms the bottom half of the small car-park on Thorngrove Road. 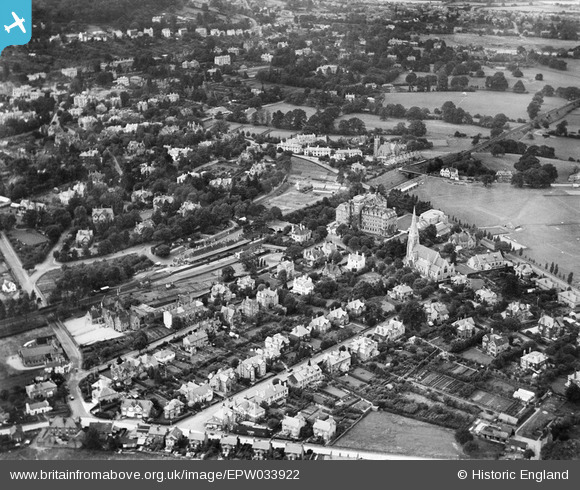 These two pictures from the Britain from Above project provide an excellent aerial view of the bay. 'Malvern Girls' College, Great Malvern, 1921.' The bay can be seen containing two wagons. 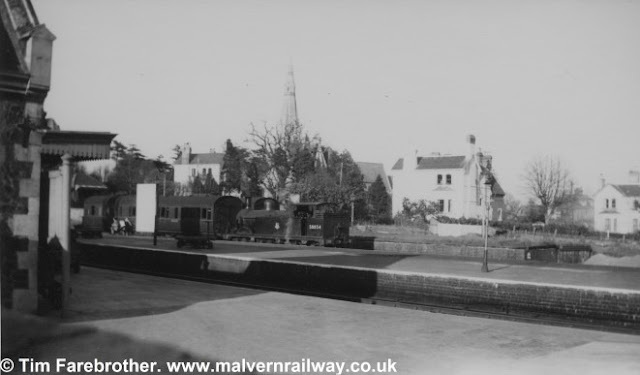 Shots of trains in the old bay are reasonably easy to track down, and generally show a single carriage with a tank engine or other small locomotive sat behind ready to pull the passengers out tender-first. A longer view of the bay. 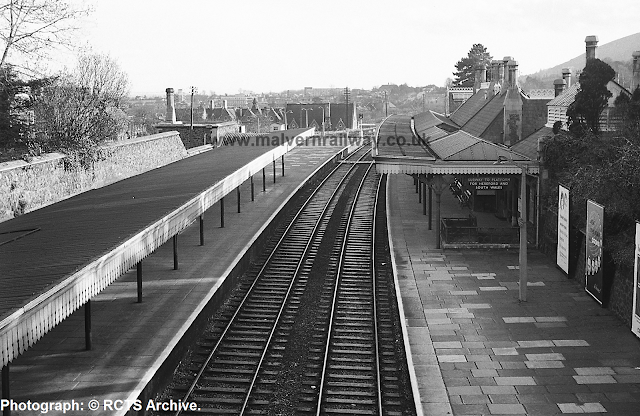 A similar image to the one above, taken in the late 1970s looking across Platform One to the now derelict Midland platform. A much rarer perspective, taken from the eastern side of the Midland bay. 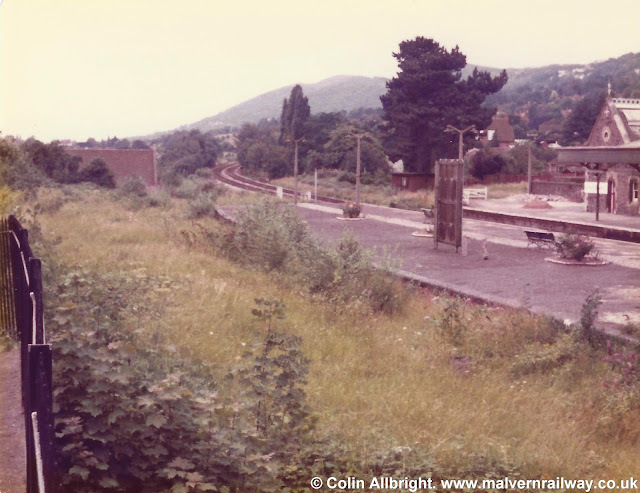 This is a really great angle, showing the abandoned bay platform at Great Malvern in the late 1970s. The fence in the distance marks the route of the old bay platform access line. Final Destination: The end of the bay is now the lower level of the car park. 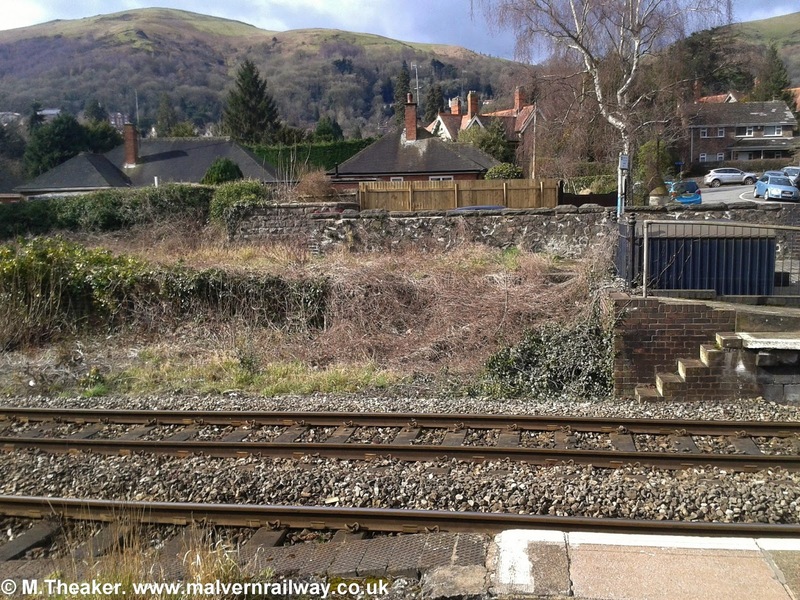 The second 'missing feature' at Great Malvern is the old goods bay at the southern end of Platform One. 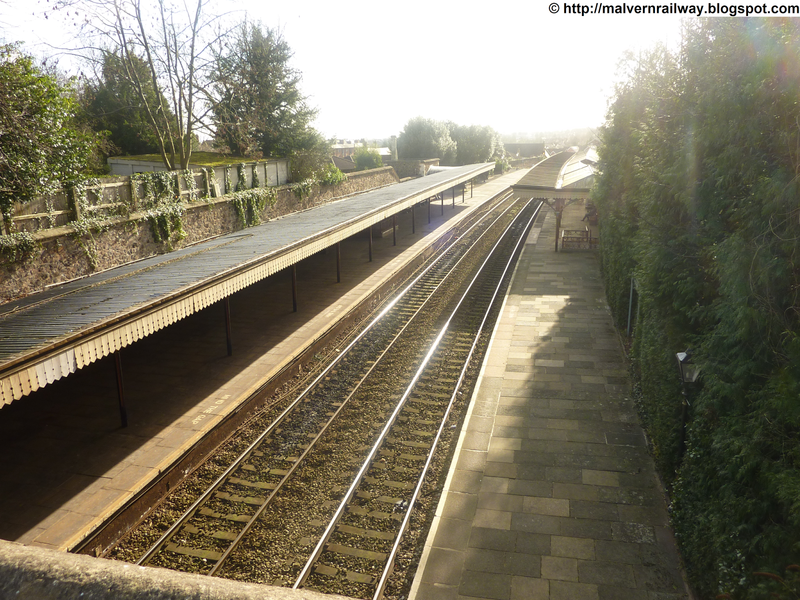 The picture below shows the steps which led down to the trackside, where goods vans would be parked to be unloaded. 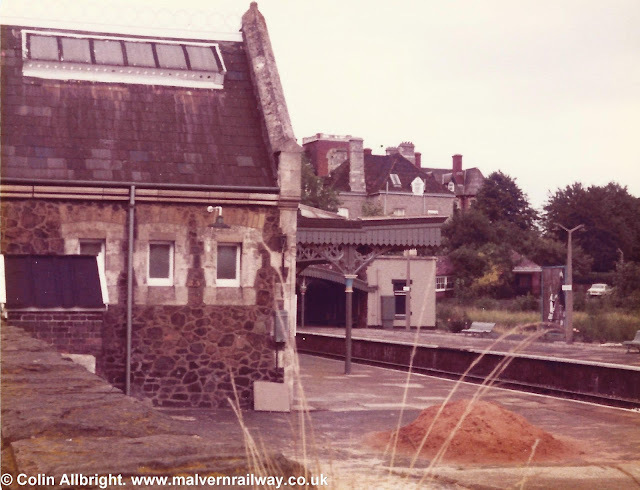 Twenty-five years later, this shot shows the now-disused bay, and the very short loading platform that ran alongside it. Note also the land on the right-hand side of the shot: the old bay has been removed but the land has not yet been sold for development. A good view of the bay is provided (briefly!) 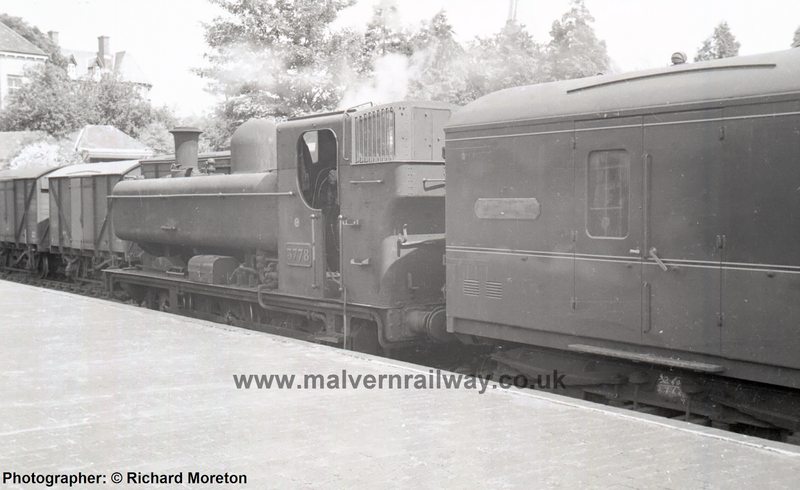 in this old video of a Ledbury train provided by the Huntley Film Archives on Youtube. Skip to 4:50 to see the bay. 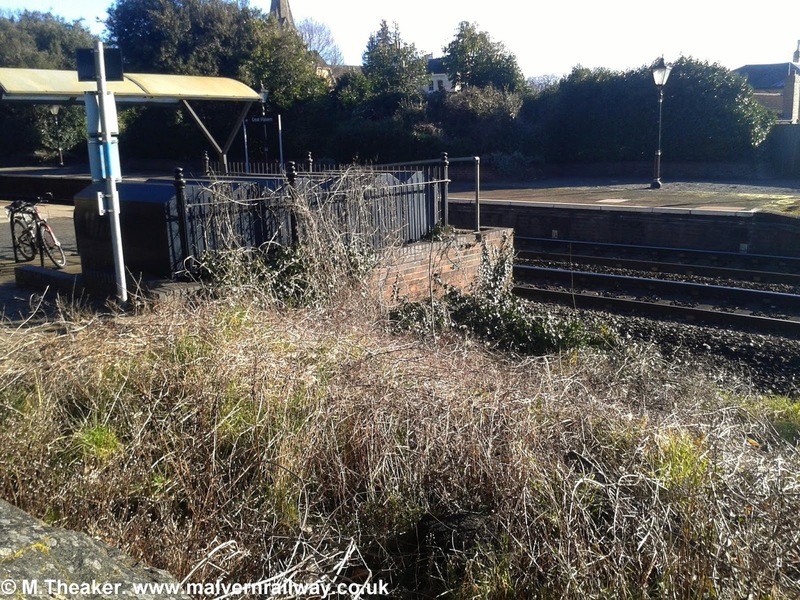 Today, the bay is somewhat neglected and overgrown, but is still clearly visible at the south of the station. A quick tidy up would really bring this historical feature back to life. 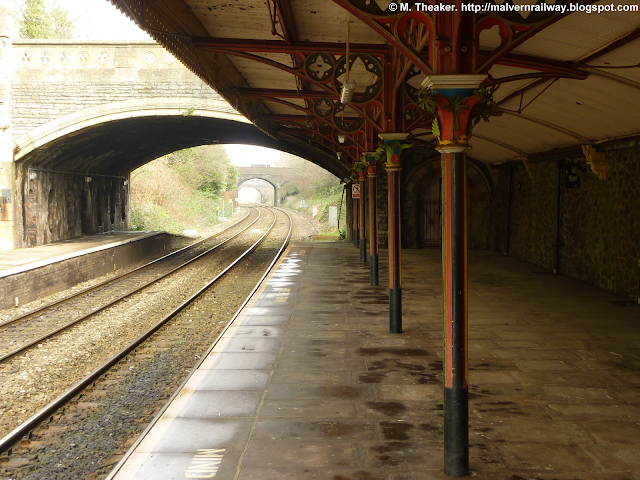 Overlooking the disused bay from behind Platform One. The view across from Platform Two. The short loading pier is still clear below the weeds. The third and final 'missing feature' at Great Malvern is the old turntable that allowed goods vans to be backed up from trains arriving into Platform Two and fed straight into the basement of the Imperial Hotel (more information below). 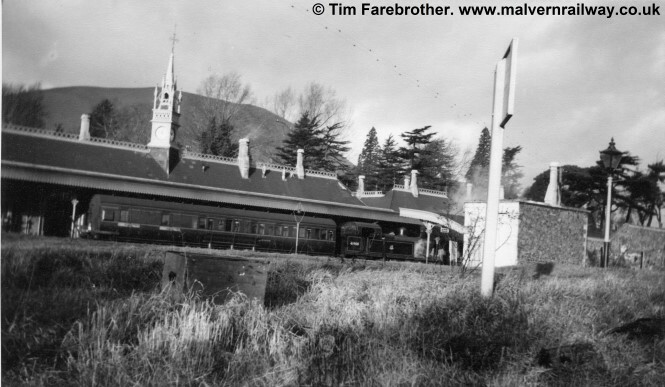 This shot from 1949 shows a glimpse of the turntable spur, to the right of the train entering the station. The same shot in 2016. The grey lineside cabinet marks the location of the old turntable. The service door is also visible, next to the 'Worm' (see #5). Another interesting feature at Great Malvern was the signal box that once stood at the end of Platform 2, sandwiched between the old bay lines and the remaining line. Pictures of this box are surprisingly rare and I am working on finding some more to display here. 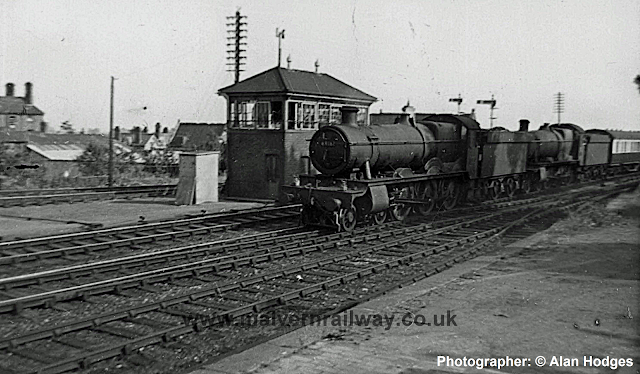 The signal box during its heyday - Manby Road school is visible behind. 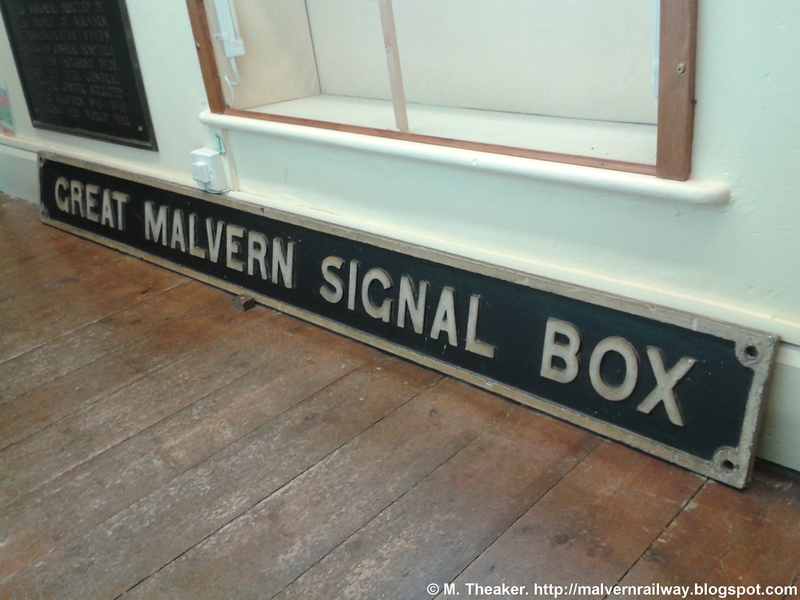 The original signal box sign at Malvern Museum. 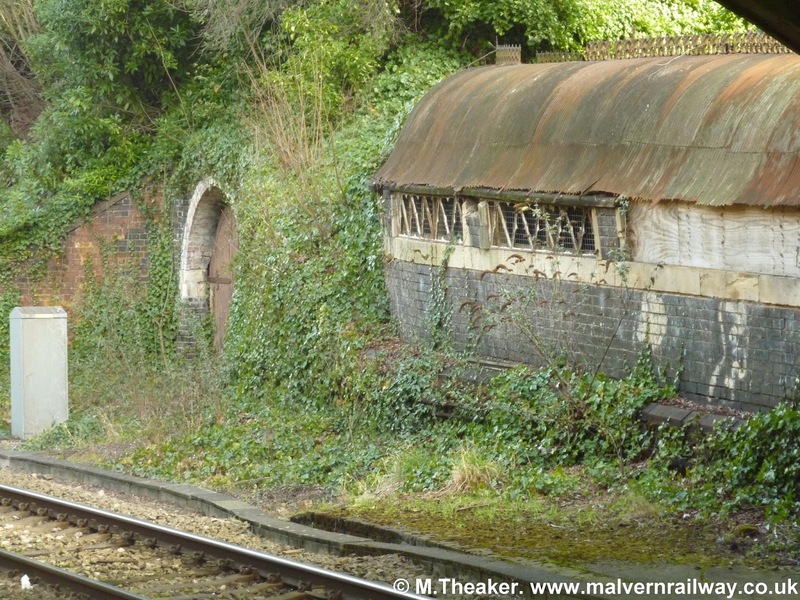 'The Worm' was a corrugated metal tunnel designed to allow first-class passengers arriving in Malvern to access the hotel without having to leave cover (or to mingle with their second-class counterparts!). 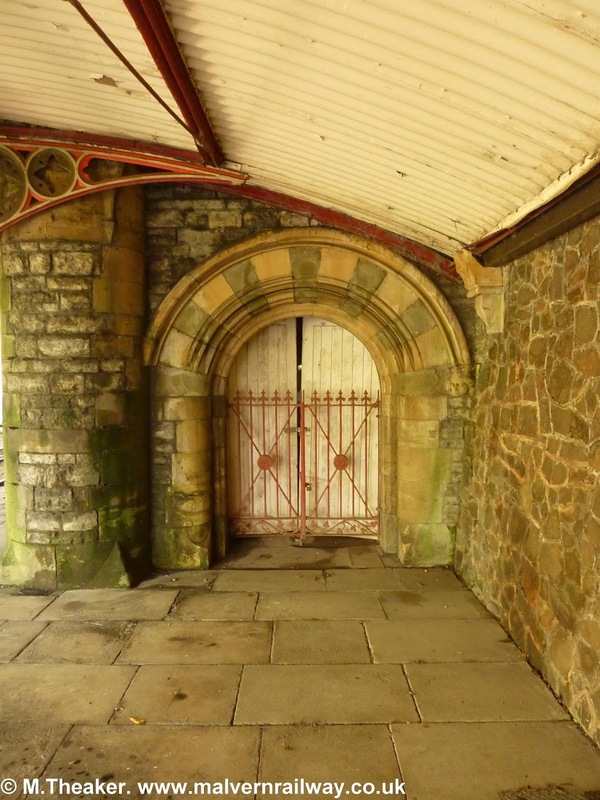 The tunnel is sadly neglected today, with both ends locked to prevent access to what is now a school. There are plans to see the feature restored, however. The locked door to 'The Worm'. Here we see the Worm on the right and the hotel's service door behind. This shot was taken in the 1870s, and shows the Imperial hotel on Avenue Road in its freshly-built state. The railway embankment has just been planted and the hotel sits alone on what would then have been the edge of Great Malvern. 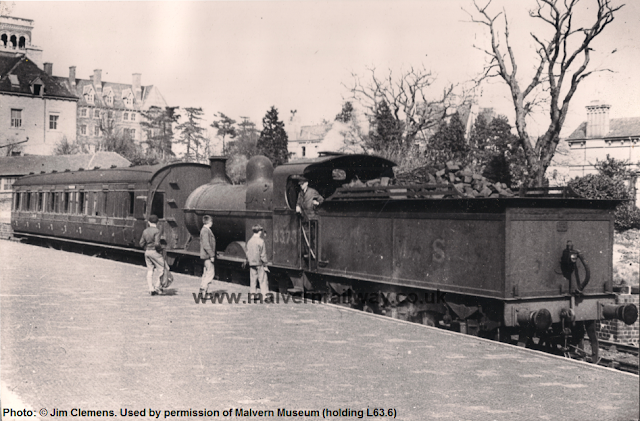 A couple of noteworthy railway-related features stick out, the first of which is the large wooden door sitting perpendicular to the track: this was attached to a small turntable which allowed coal trucks to be rotated ninety degrees and pulled directly into the hotel's cellar. 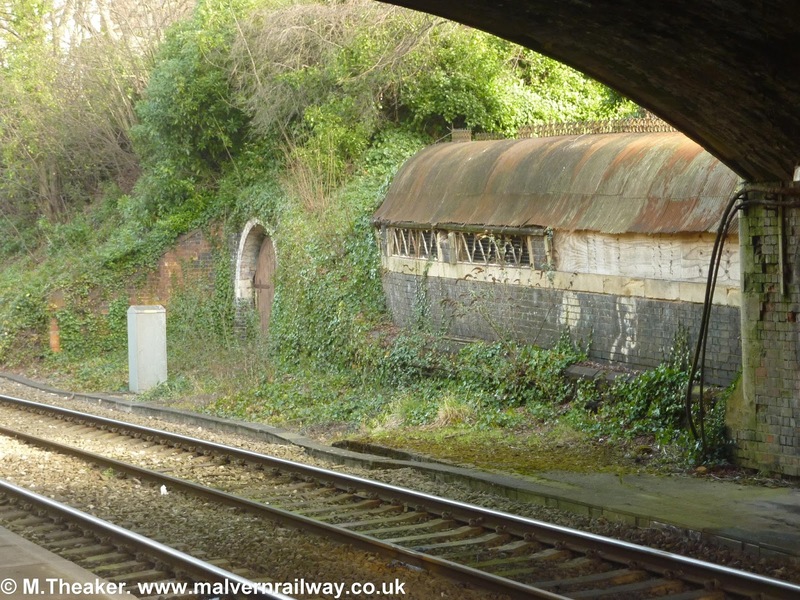 The second is the corrugated iron tunnel leading up to the hotel: known as 'The Worm', this allowed first-class passengers coming into Malvern to alight on Platform 2 and walk straight into the hotel without going outside. The Imperial Hotel during the 1870s. Used by kind permission of Keith Smith. Fast-forward 140 years, and not too much has changed. 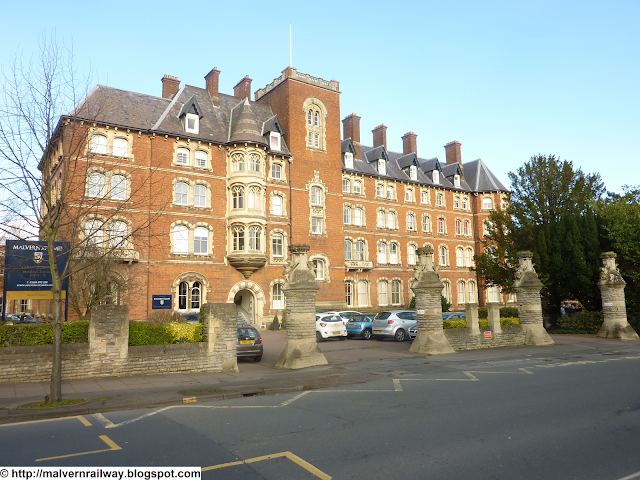 The Imperial Hotel was taken over by Malvern Girls' College (since 2006 Malvern St James') in 1919 and has been in use as an independent school ever since. 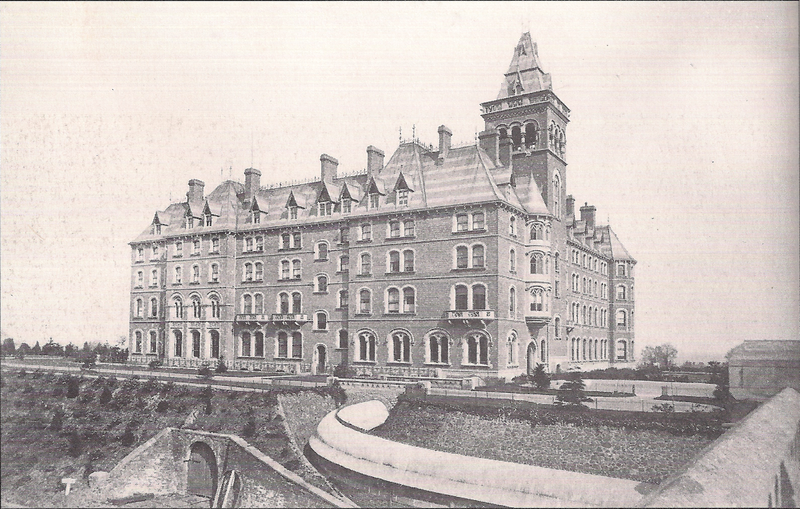 Architecturally, the front of the hotel has been widened with an additional wing, which now blocks the view of the offset staircase windows seen in the 1870s shot. The pointed roof has also been dismantled and replaced with a flat-top tower and flag pole. The tall trees and overgrowth make it tricky to see, but the coal door is still present but now defunct, while The Worm too is now somewhat delapidated, being unusable for its original purpose. Malvern St James' School today. The former Imperial Hotel from Avenue Road. Note the extra wing on the left. 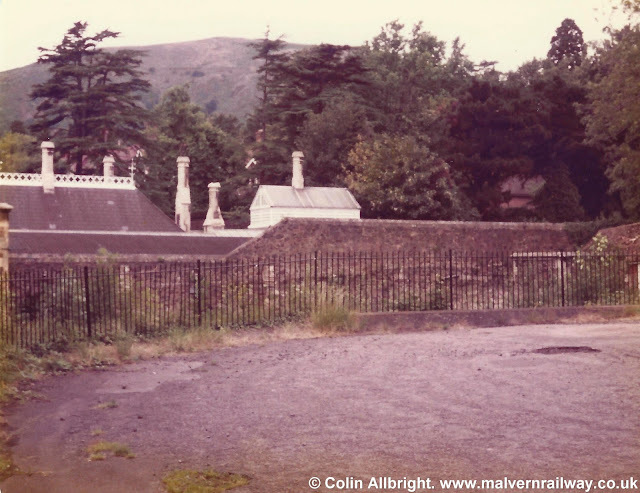 Sitting on the slope above Great Malvern station is Rowallan, a house often recorded as being the former Station Master's residence. 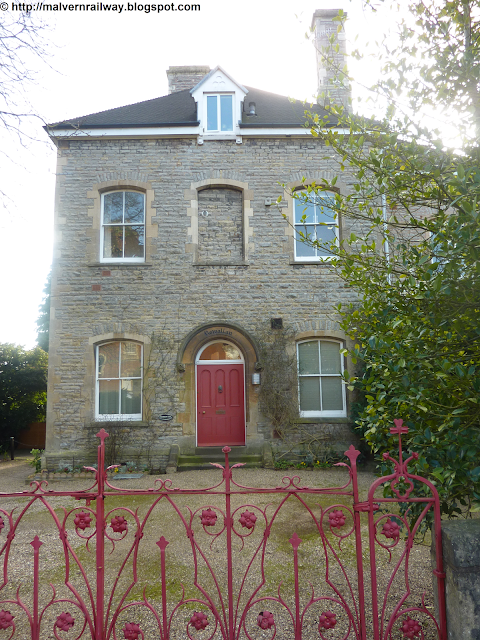 Now divided into several flats, the house is nonetheless mostly untouched on the outside, and overlooks both the station and the former Imperial Hotel across Avenue Road. 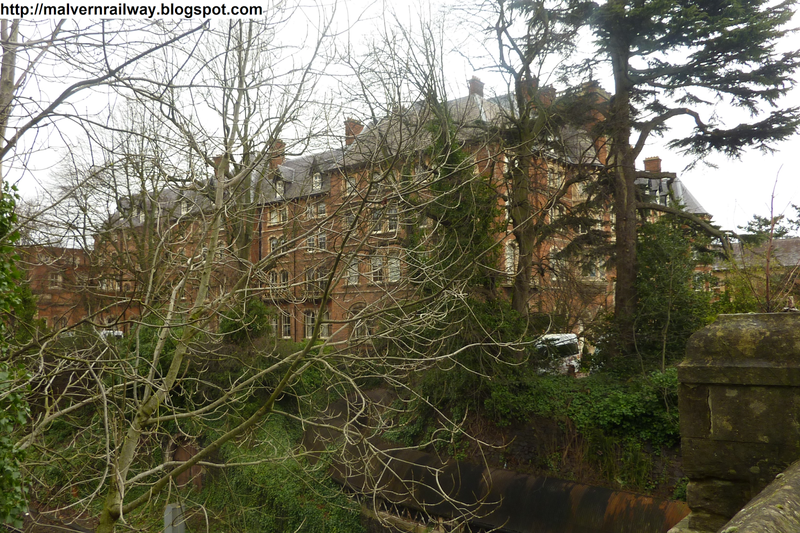 Rowallan House from Avenue Road. 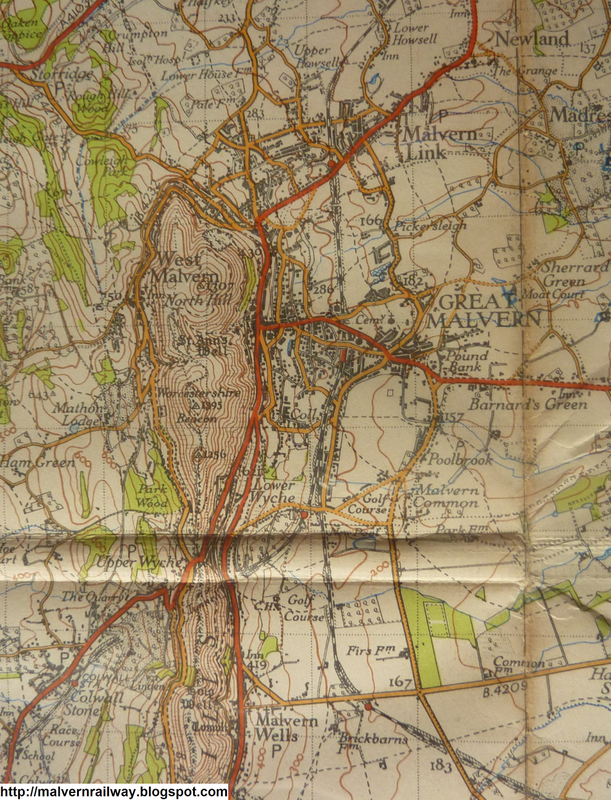 These have been taken from a 1946 one-inch map (Sheet 143) of Worcester to Gloucester, which is out of copyright as of this year. The image below shows the entire route of the Malvern-Aschurch railway from Great Malvern station, down to Hanley Road, Upton, Ripple, Tewkesbury and finally, Ashchurch, where the old route north to Bredon on the Birmingham-Gloucester line can also be seen. 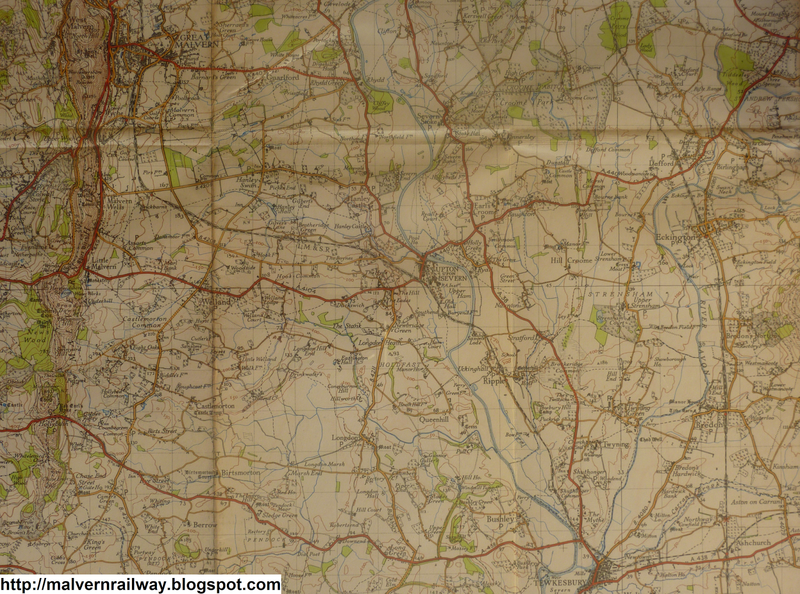 The route leading east out of Ashchurch is the now-defunct Ashchurch, Evesham and Redditch line of which only the first mile or so remains, serving the Ministry of Defence's storage facility for armoured vehicles. Click here for a large version of the map. During autumn 2015, I was walking on Malvern Common trying to find the old Malvern Wells Great Western Railway station. Walking down to the north entrance of Worcestershire Golf Club to get onto the embankment next to the existing Worcester-Hereford line, I noticed a public footpath leading down the eastern side of the golf course that I had never seen before. Closer inspection revealed it to be an old railway line, with a few old fenceposts and a very clear embankment carved into the earth. 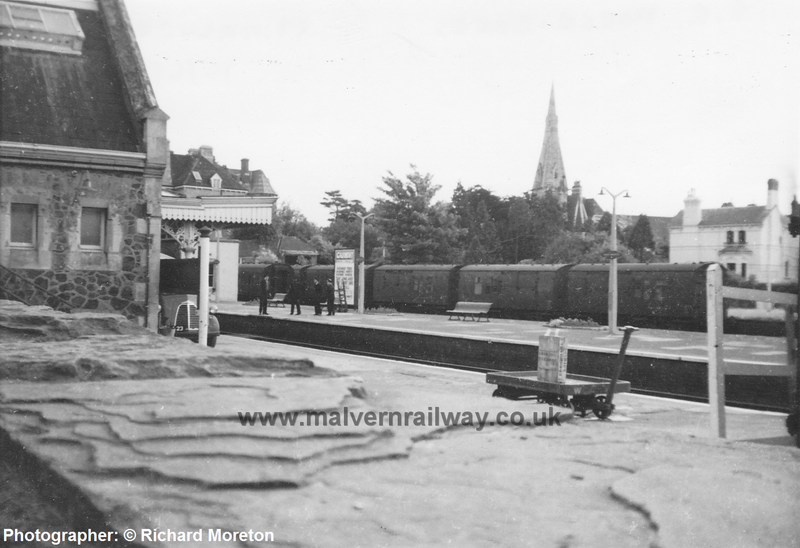 Looking for more information about this old line, I discovered that it was the trackbed of the Midland Railway's old Malvern-Ashchurch branch which ran from Great Malvern station through Upton, Ripple and Tewkesbury through 13 miles of Worcestershire and Gloucestershire until 1952. Later, I also found this article from the Gloucestershire Echo explaining how part of the remaining embankment at the Mythe in Tewkesbury had been demolished to open up the floodplain in an attempt to prevent a recurrence of the flooding which submerged the town in 2007. 1. 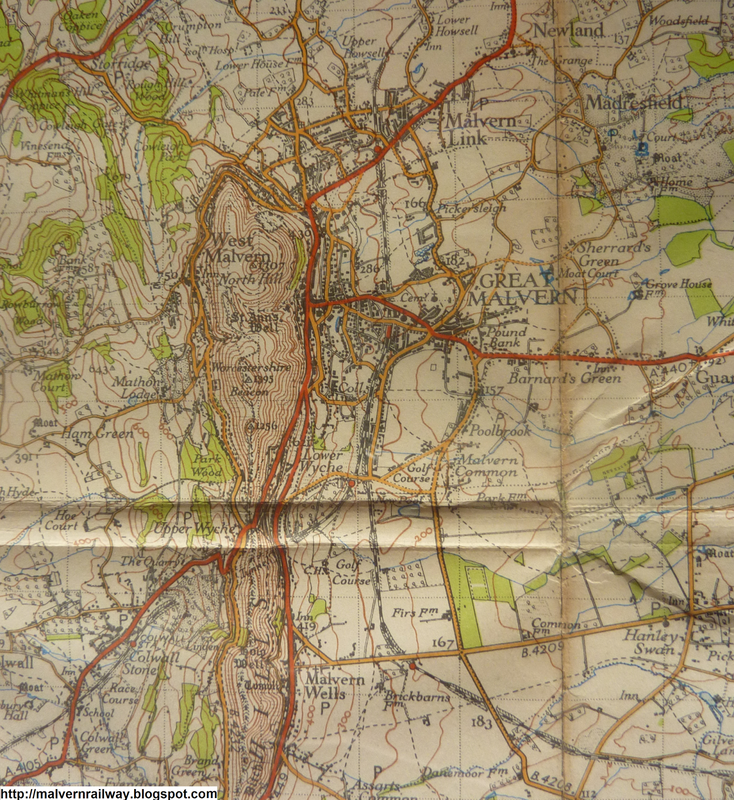 To photograph and film what remains of the route before time, nature and council planning officers damage it any further. 2. To collect any historical photographs, documents, memories or other items all in in one place. 3. To help walkers by noting points of interest and highlighting how to get close to them (legally!) using public footpaths and bridleways. As such, this site is intended not just to help fans of old railway lines or those interested in local history, but has also been put together to show off some of the most beautiful countryside in the West Midlands, and indeed the United Kingdom. I hope you enjoy it. Contact: To get in touch, please leave a comment below (or on the appropriate page). You can also tweet me at @malvernrailway. This agreement from March 1865 is a far more efficient working arrangement devised between the Midland and Great Western railway companies, who agreed to share amicably the short joint section of track which ran between the junction of their two lines and Great Malvern station. 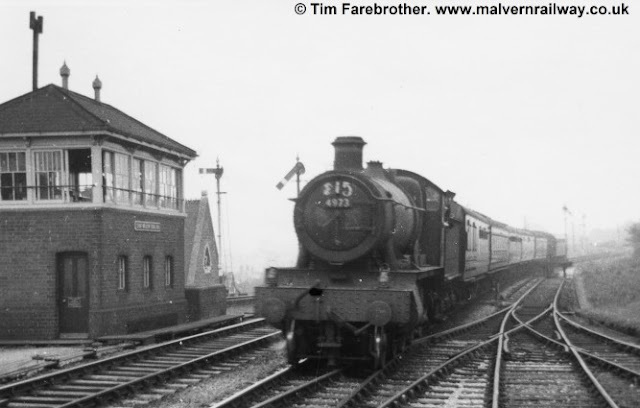 Perhaps most interesting, however, is the fourth clause, which allowed the Midland Railway to build its sheds and sidings at Tewkesbury Junction on Malvern Common. This document can also be found in the Local Studies section of Malvern Library, who have allowed me to reproduce it here. 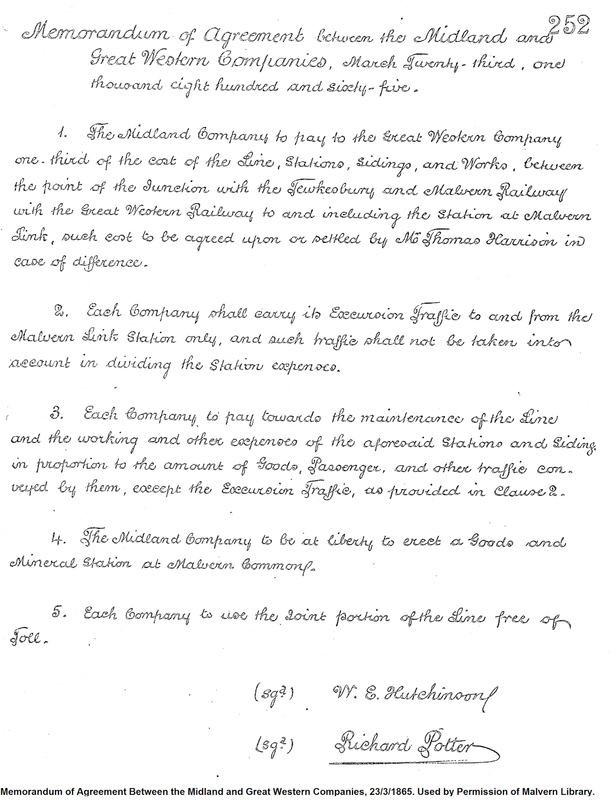 Memorandum of Agreement between the Midland and Great Western Companies, March Twenty-third, one thousand eight hundred and sixty-five. 1. The Midland Company to pay to the Great Western Company one-third of the cost of the Line, Stations, Sidings, and Works, between the point of the Junction with the Tewkesbury and Malvern Railway with the Great Western Railway to and including the Station at Malvern Link, such cost to be agreed upon or settled by Mr Thomas Harrison in case of difference. 2. 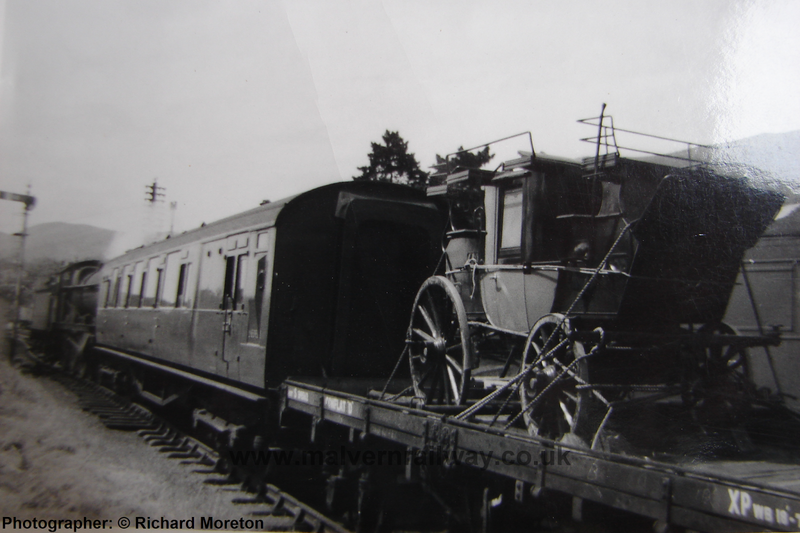 Each Company shall carry its Excursion Traffic to and from the Malvern Link Station only, and such traffic shall not be taken into account in dividing the Station expenses. 3. Each Company to pay towards the maintenance of the Line and the working and other expenses of the aforesaid Stations and Sidings in proportion to the amount of Goods, Passenger, and other traffic conveyed by them, except the Excursion Traffic, as provided in Clause 2. 4. 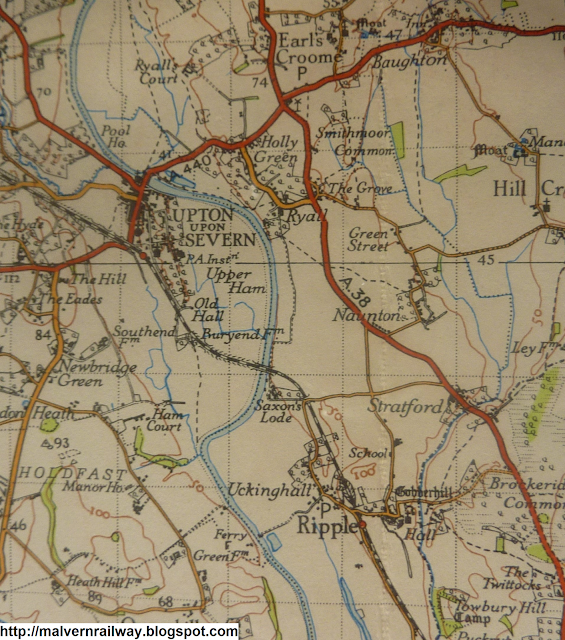 The Midland Company to be at liberty to erect a Goods and Mineral Station at Malvern Common. 5. Each Company to use the joint portion of the Line free of Toll. 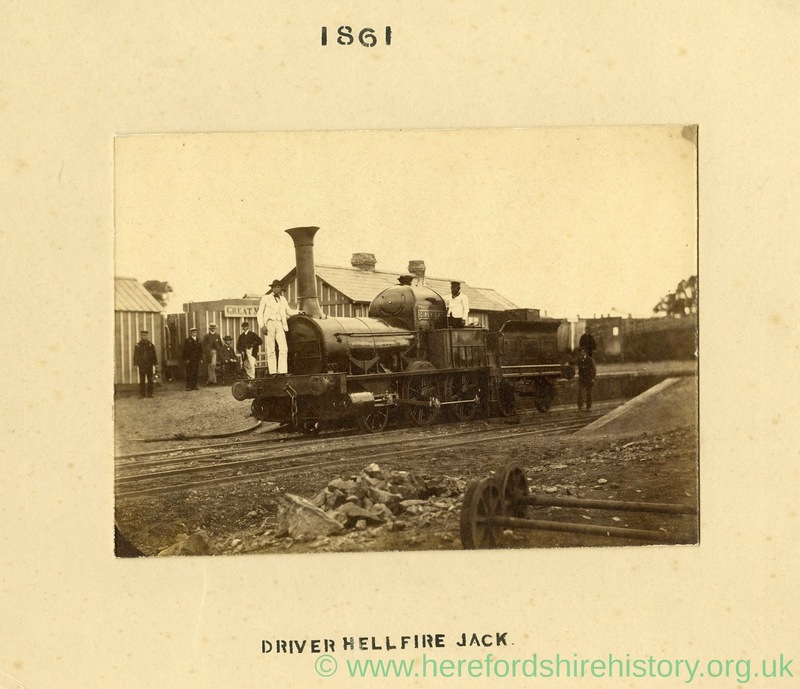 This document is an agreement between the Tewkesbury, Midland, and Worcester and Hereford railway companies, which is undated but presumably was signed before the W&HR was absorbed into the West Midland Railway in 1861. 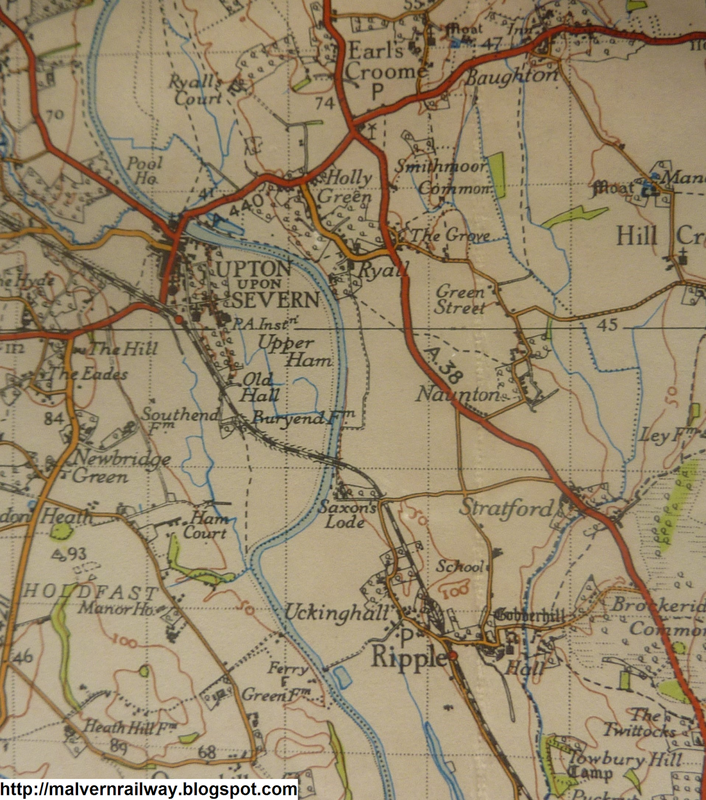 The agreement amounts to a working arrangement to share the line and facilities between Ashchurch and Malvern, and is an exercise in overzealous Victorian legal jargon. The agreement can be found in the Local Studies section at Malvern Library, who have generously allowed me to reproduce the document here. ...Tewkesbury Railway Company on the one hand, and each of the Midland Railway Company and the Worcester and Hereford Railway Company, so far, but so far only, as they respectively are interested, on the other hands. Firstly,- These Heads to be subject to the sanction of Parliament. 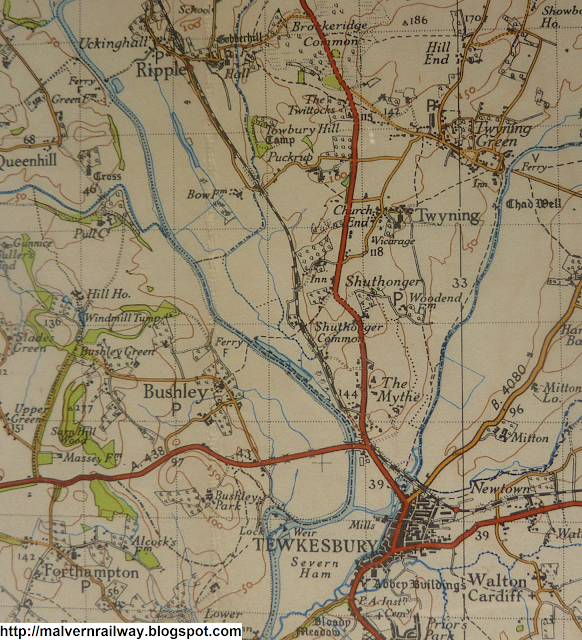 Secondly,- The Tewkesbury Company, at their own expense, to make and complete the new Line, Buildings and Works, according to their Act, as a single Line, but, except as regards the Tunnel, with Land and Overbridges for a Double Line, and with Double Line where requisite, and all to the reasonable satisfaction of the Midland Company’s Engineer. Thirdly,- The new Line and Works to be maintained by the Contractor for making the Railway for twelve months after completion, to the satisfaction of the Midland Company’s Engineer. 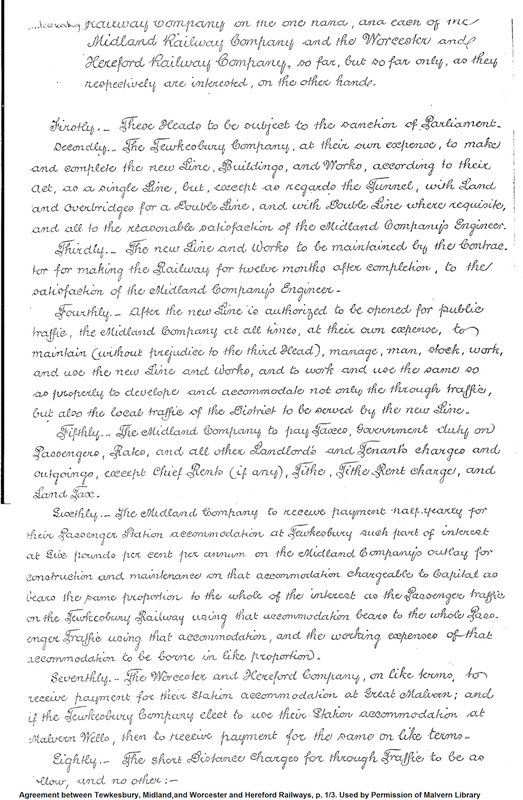 Fourthly,- After the new Line is authorised to be opened for public traffic, the Midland Company at all times, at their own expense, to maintain (without prejudice to the third Head), manage, man, stock, work, and use the new Line and Works, and to work and use the same so as properly to develope and accommodate not only the through traffic, but also the local traffic of the District to be served by the new Line. Fifthly,- The Midland Company to pay Taxes, Government duty on Passengers, Rates, and all other Landlord’s and Tenant’s charges and outgoings, except Chief Rents (if any), Tithe, Tithe Rent charge, and Land Tax. Sixthly,- The Midland Company to receive payment half-yearly for their Passenger Station accommodation at Tewkesbury such part of interest at Six pounds per cent per annum on the Midland Railway’s outlay for construction and maintenance on that accommodation chargeable to Capital as bears the same proportion to the whole of the interest as the Passenger traffic on the Tewkesbury Railway using that accommodation bears to the whole Passenger Traffic using that accommodation, and the working expenses of that accommodation to be borne in like proportion. Seventhly,- The Worcester and Hereford Company, on like terms, to receive payment for their station accommodation at Great Malvern; and if the Tewkesbury Company elect to use their Station accommodation at Malvern Wells, then to receive payment for the same on like terms. Eighthly,- The short Distance Charges for through Traffic to be as below, and no other:- (A) The Midland Mileage between the point of Junction at Tewkesbury and Ashchurch for traffic to, from, and through Malvern and intermediate Stations on the new Line to be calculated as Three miles. 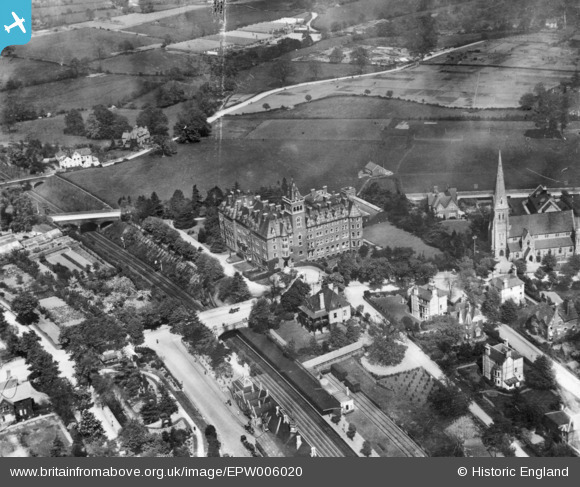 (B) The Worcester and Hereford mileage between the point of Junction (if any) near Malvern Wells Station and Great Malvern, for traffic to, from, and through Ashchurch and intermediate Stations on the new Line, including any Station at Tewkesbury and the Great Malvern Station, and the Link Station respectively to be calculated, as regards the Great Malvern Station, at Two miles, and as regards the Malvern Link Station, at Three miles. 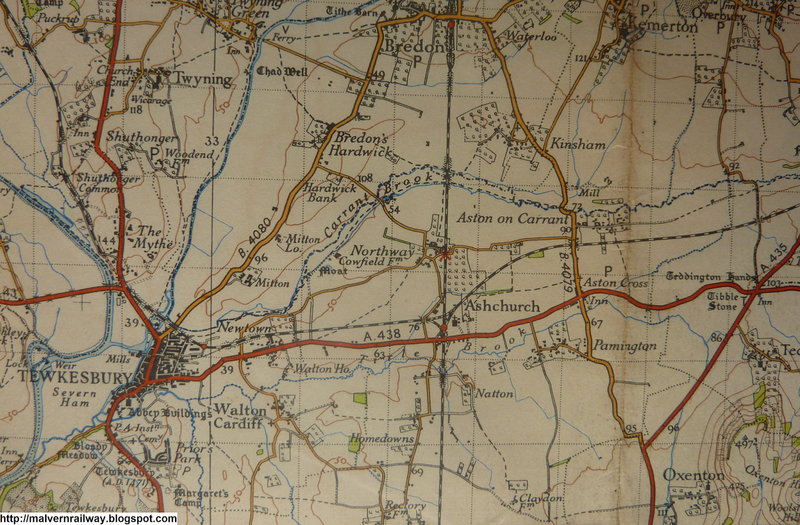 Ninthly,- The Mileage charge for through traffic to be as follows:- (C) The Midland Company to receive their actual mileage (three miles the minimum) upon all traffic passing to, from, and over the new Line, and going beyond Ashchurch on the Midland Railway. 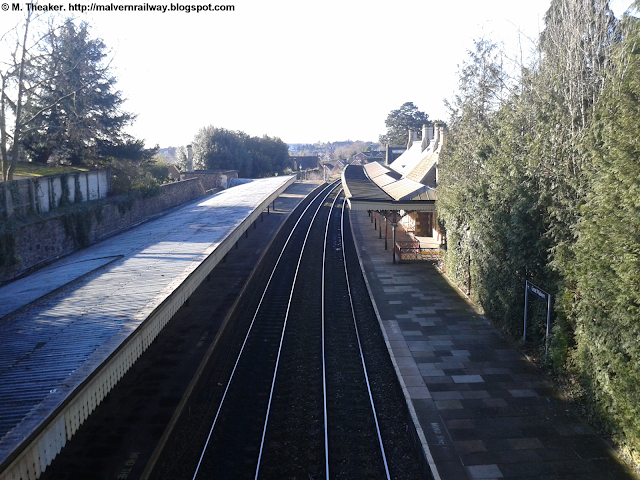 (D) The Worcester and Hereford Company to receive their actual mileage (three miles the minimum) upon all traffic passing to, from, and over the new Line, and going beyond Malvern Link Station on the Worcester and Hereford Railway. 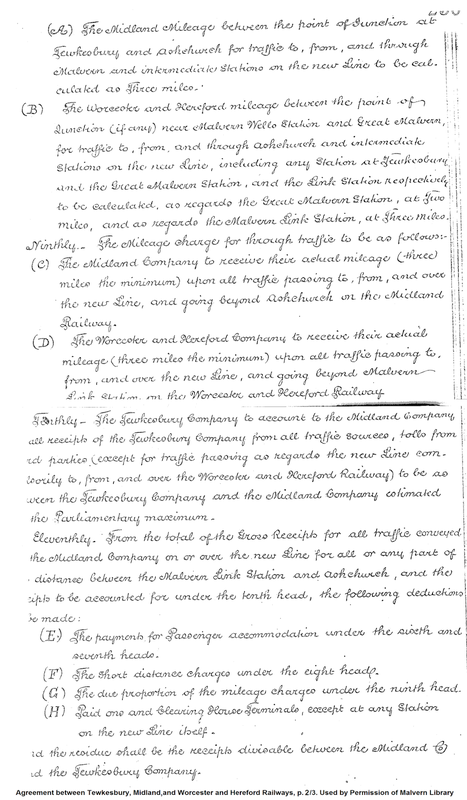 Tenthly, - The Tewkesbury Company to account to the Midland Company all receipts of the Tewkesbury Company from all traffic sources, tolls from third parties (except for traffic passing as regards the new Line compulsorily to, from, and over the Worcester and Hereford Railway) to be as between the Tewkesbury Company and the Midland Company estimated at the Parliamentary maximum. 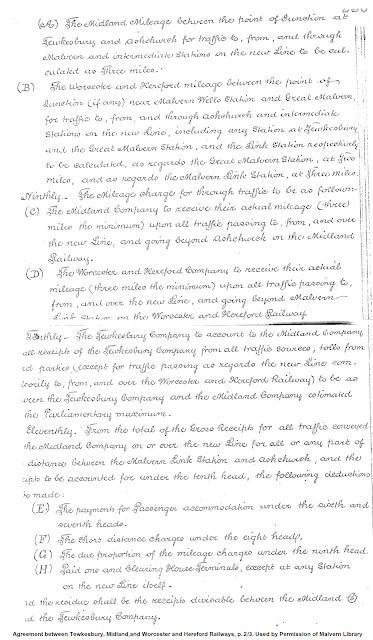 Eleventhly,- From the total of the Gross Receipts for all traffic conveyed by the Midland Railway on or over the new Line for all or any part of the distance between the Malvern Link Station and Ashchurch, and the receipts to be accounted for under the tenth head, the following deductions to be made: (E) The payments for Passenger accommodation under the sixth and seventh heads. (F) The short distance charges under the eighth head. (G) The due proportion of the mileage charges under the ninth head. (H) Paid one and Clearing House Terminals, except at any Station on the new Line itself. and the residue shall be the receipts divisable between the Midland Co. and the Tewkesbury Company. Twelfthly,- In estimating the Gross Receipts all traffic carried by the Midland Railway Company between the Great Malvern and Malvern Link Stations respectively on the one hand, and the Stations on the Midland Railway between Ashchurch and Bristol, both inclusive, on the other hand, be taken, as to one half thereof as passing via Tewkesbury, and as to the other half thereof as passing via Worcester. 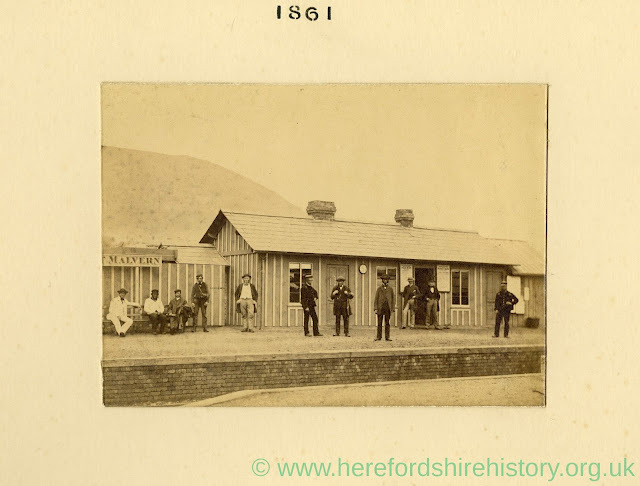 Thirteenthly,- Fifty per cent of the divisable receipts to be paid to the Midland Company for their expenses of the maintenance, management, and working of the new Line, and the other Fifty per cent to be paid to the Tewkesbury Company. Fourteenthly,- The division of the Gross Receipts to be made half-yearly, and accounts to be rendered half-yearly. 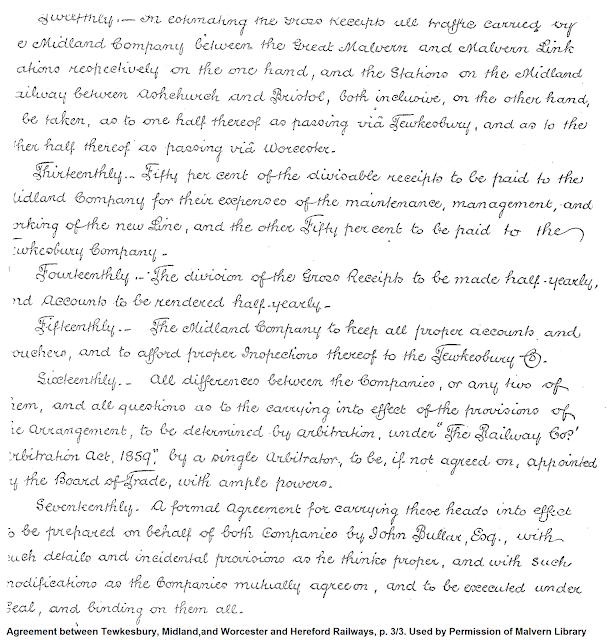 Fifteenthly,- The Midland Company to keep all proper accounts and vouchers, and to afford proper Inspections thereof to the Tewkesbury Co..
Sixteenthly,- All differences between the Companies, or any two of them, and all questions as to the carrying into effect of the provisions of the arrangement, to be determined by arbitration, under ‘The Railway Co.’s Arbitration Act, 1859’, by a single arbitrator, to be, if not agreed on, appointed by the Board of Trade, with ample powers. 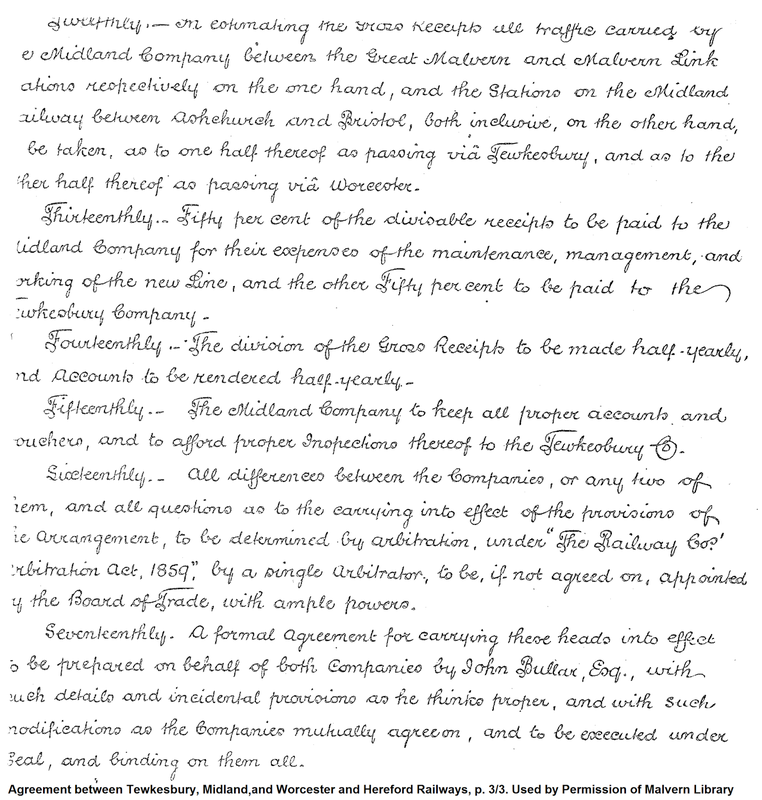 Seventeenthly,- A formal agreement for carrying these heads into effect to be prepared on behalf of both Companies by John Bullar, Esq., with such details and incidental provisions as he thinks proper, and with such modifications as the Companies mutually agree on, and to be executed under Seal, and binding on them all. Clive's Fruit Farm / Upper Hook Rd.